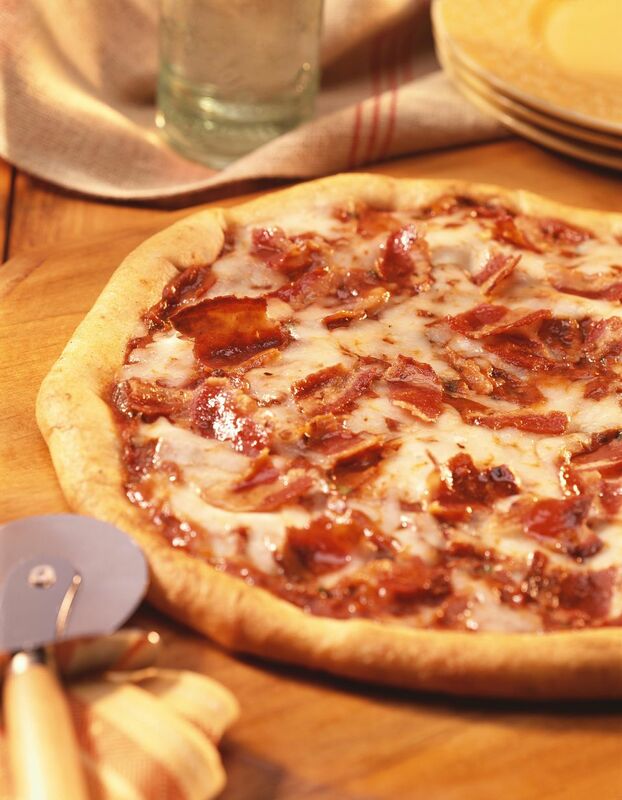 You can use a Boboli® crust, or make Yeast Crust and use half of it for this easy and delicious recipe for Bacon Pizza. For less fat and sodium, you could use 1 cup chopped Canadian bacon instead of cooked strip bacon, or add some pepperoni. True bacon loves may want to use both! The bacon has to be cooked to a crisp consistency for this recipe, otherwise it will become too soft in the sour cream sauce and cheese. You can certainly add more bacon if you'd like! I always like to prebake my pizza crust before I add the toppings. If there's one thing I can't abide it's a soggy pizza crust. If you make your own dough, or if you buy some from your local pizza place or use pizza dough from a tube, roll it out and prebake it. Your pizzas will be much better. For a while I used a pizza stone, but then I decided that the pizza was just fine without that extra work. A pizza stone has to heat up for a long time in the oven before it is hot enough to use. I find that pizzas get crisp and crusty baked on a thin metal cookie sheet. You can use other cheeses in this easy recipe. Havarti, Swiss, Gruyere, Monterey Jack, or Pepper Jack for a bit of spice would all be wonderful. In fact, you might want to double this recipe and make two pizzas! They'll go fast. Heat oven to 425 F. Make and prebake yeast crust if using. Prebake the crust for about 5 to 7 minutes even if you buy one from a pizza place. No need to prebake Boboli® crust. Heat oil in a large skillet and saute onions and garlic until tender, about 6-7 minutes. Add paprika and flour and cook and stir for 3 minutes. Add sour cream, thyme, and marjoram leaves and cook until thickened, about 1-2 minutes longer. Stir in mustard. Spread this sauce over the prebaked crust and top with bacon and cheeses. Bake at 425 F for 9-15 minutes until crust is golden brown and cheese is melted. Cut into squares or wedges and serve.